President Donald Trump is seen on monitors in the briefing room of the White House, as he gives a prime-time address in the Oval Office, Jan. 8, 2019. Here are three facts about the U.S. southern border with Mexico that Americans didn't hear Tuesday night from U.S. President Donald Trump during his Oval Office address, and why they matter when discussing the issue. 1. The U.S. government admits it doesn't know how effective border fencing and walls are and if they are worth the money. Parts of the U.S. border with Mexico already have walls and fencing. But two reports in the last two years from the U.S. General Accounting Office say the U.S. Customs and Border Protection (CBP) - the agency tasked with guarding the border - is just not sure of what the barriers actually accomplish. "We found that CBP had not accounted for the impact of its investment in border fencing and infrastructure on border security," the GAO wrote in an August 2018 report. A year earlier, the agency determined that CBP "does not have metrics to assess the contributions of border fencing." So while Congress and the president debate using steel versus concrete barriers, the real key is in getting the data to show what works and what doesn't for border security. CBP has a plan to shore up its metrics on border barriers by January 2019, according to the August GAO report, but they have yet to be seen. 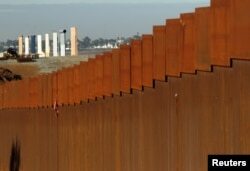 FILE - Prototypes for U.S. President Donald Trump's border wall are seen behind the border fence between Mexico and the United States, in Tijuana, Mexico, Jan. 7, 2019. 2. "America proudly welcomes millions of lawful immigrants," Trump said, though there's some context missing here. This is accurate, over time. But in Fiscal Year 2018 - and going a few years back - the U.S. government has issued about a half-million immigrant visas annually. Last year it was 533,557, according to U.S. State Department data, on a downward trend since 2016. Non-immigrant visas - like those for tourists and business travelers - are down as well, from a five-year peak of 10.9 million in FY2015, to 9 million in FY 2018, according to State Department data. Why does it matter whether there are a million immigrants in one year, or two? Well, the Trump administration has a track record of fuzzy math on immigration issues so it's good to be specific about the data, and the context. 3. Border apprehensions are staying steady, but the number of families is increasing. The number of unaccompanied children apprehended was slightly down in December, according to new data obtained by The Washington Post; the number of families detained by the U.S. CBP was up. But the big takeaway is that altogether, families and unaccompanied children are making up an increasing share of those detained at the border in recent months - from 55 percent in October, to 64 percent in December. 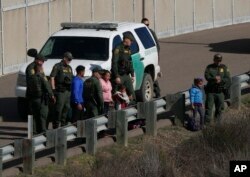 FIEL - A woman and children stand amidst U.S. Border Patrol agents after crossing illegally over the border into San Diego, California, as seen from Tijuana, Mexico, Dec. 9, 2018. Compare that to an average of about 40 percent the previous two years. Overall, from October and November 2017 to the same period in 2018, family unit apprehensions increased 307 percent. What does that mean for the U.S. government? For starters, more children mean more facilities and services are needed that focus on these young travelers. And that's an issue that's intensified in the last month when two migrant children died in CBP custody.